These two little bears just wanted to say, "Hi!" Each bear has a letter on their tummy that spells out "Hi". They are holding hands and one of them has a speech bubble with a heart in it. 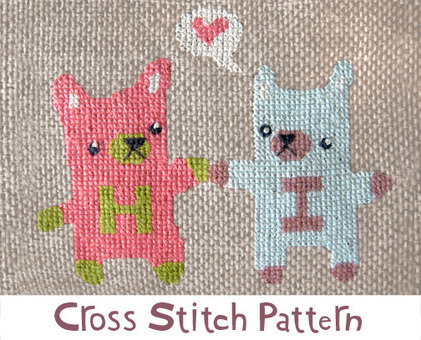 This 2 page PDF file includes an image of the finished cross stitch, cross stitch pattern, simple cross stitch instructions and color suggestions.